This gospel number was probably recorded in the studio in 1956 by Elvis; a home recording also exists, made in Waco in 1958. There is some speculation that "Tell Me Why," recorded by Elvis in 1957 (see below), was also based on this tune. It is thought that "Just A Closer Walk With Thee" is a comparitively recent song, perhaps dating from the evangelical crusades of the 1930s, though its origins have already been lost. Red Foley's 1950 recording was one of the first religious hits in Country music (see also "When God Dips His Love In My Heart.") 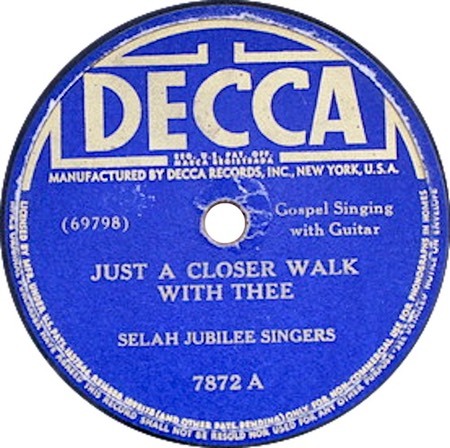 Although the original of "Just A Closer Walk With Thee" was made by the Selah Jubilee Singers on 8 October 1941 (Decca 7872), the number is most associated with Sister Rosetta Tharpe, who recorded her own version on 2 December 1941 (Decca 8594). Sister Rosetta Tharpe was born Rosetta Nubin in 1915. She started using her artist's name in the mid-1930s and had her first hits with Decca in 1938. Tharpe toured with Marie Knight in the 1940s and early 1950s, when they also ventured into blues. Perhaps this is how Knight got the idea for her "Tell Me Why" with which "Just A Closer Walk With Thee" is so associated. Sister Rosetta Tharpe died in 1973.